A St Mirren side boosted by the return of key players showed spirit by taking their Scottish Cup fourth round tie with Inverness CT to a replay. Steven Thompson and John McGinn injected more life into the Buddies, who took the lead through Marc McAusland's close-range finish. Inverness were rattled but Saints struggled to threaten after the break. And the Highland onslaught resulted in Josh Meekings firing through a ruck of players to level. So both teams enter Monday's fifth round draw ahead of Tuesday's rematch and Saints boss Tommy Craig will hope this proves to be a turning point. After five matches without a win, belief was in short supply down Paisley way and the meagre crowd inside St Mirren Park reflected that. Less than 2000 turned up to witness this relatively tasty looking all-Premiership tie, perhaps because they doubted the Buddies had any goals in them. Saints had not hit the back of the net in November until McAusland's strike brought some much-needed positivity to the place. The centre back was still up from a corner to turn in Jason Naismith's low cross from the right and end over 300 goalless minutes for the hosts. Shouts of "we scored, we actually scored" from home supporters were still being uttered when Caley Thistle's David Raven whistled a shot narrowly wide to offer a reality check. Buoyed by the return of McGinn in midfield and captain Thompson in attack, St Mirren's Kenny McLean nearly added to his three goals so far this season with a volley that went wide from Thompson's knockdown. Inverness manager John Hughes's gum-chewing on the sidelines became much more forceful after the break, and increased urgency in his charges suggested the interval chat had been fiery. It worked, because Meekings eventually drove the ball low into the net after a good old 'stramash' that the late Arthur Montford would have enjoyed. St Mirren failed to clear from a corner and Ross Draper's shot off a post ended up falling to the defender, who fired in his third goal of the season from 12 yards. In a more heated ending to the tie, questions were asked of referee Calum Murray, who did not feel a second yellow card to Caley Thistle's Ross Draper was appropriate after the booked midfielder played a risky game with a couple of fouls in the centre of the park. Ryan Christie had a couple of close efforts as St Mirren fell out of the game but overall a draw was fair. Match ends, St. Mirren 1, Inverness CT 1. Second Half ends, St. Mirren 1, Inverness CT 1. Attempt missed. Ryan Christie (Inverness CT) right footed shot from outside the box is close, but misses to the left. Attempt missed. Billy McKay (Inverness CT) right footed shot from the centre of the box is too high. Attempt missed. Aaron Doran (Inverness CT) right footed shot from the centre of the box is too high. Substitution, St. Mirren. Gary Teale replaces Isaac Osbourne. Attempt missed. David Raven (Inverness CT) right footed shot from the centre of the box is too high. Isaac Osbourne (St. Mirren) wins a free kick in the attacking half. Corner, Inverness CT. Conceded by Jeroen Tesselaar. Substitution, St. Mirren. Callum Ball replaces Steven Thompson. Substitution, Inverness CT. Aaron Doran replaces Nick Ross. Goal! St. Mirren 1, Inverness CT 1. Josh Meekings (Inverness CT) right footed shot from the centre of the box to the bottom right corner. Assisted by Ross Draper. Corner, Inverness CT. Conceded by Marc McAusland. Attempt saved. Danny Williams (Inverness CT) left footed shot from outside the box is saved in the bottom left corner. Substitution, St. Mirren. Adam Drury replaces John McGinn. Attempt missed. Billy McKay (Inverness CT) right footed shot from outside the box is too high from a direct free kick. Attempt missed. David Raven (Inverness CT) left footed shot from the centre of the box is close, but misses to the right. Isaac Osbourne (St. Mirren) wins a free kick in the defensive half. Corner, Inverness CT. Conceded by Jason Naismith. Attempt missed. Ryan Christie (Inverness CT) left footed shot from outside the box misses to the right. Corner, St. Mirren. Conceded by Josh Meekings. Attempt saved. Steven Thompson (St. Mirren) right footed shot from the centre of the box is saved in the bottom right corner. Second Half begins St. Mirren 1, Inverness CT 0. 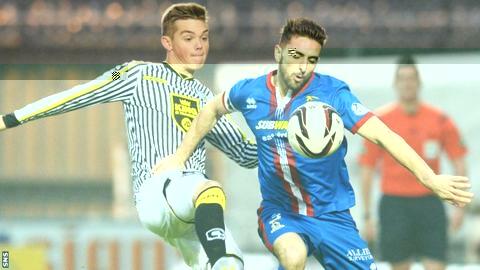 First Half ends, St. Mirren 1, Inverness CT 0.